My name is Mr. Pish. 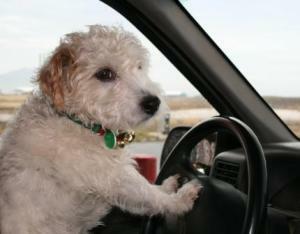 I’m a traveling terrier, star of children’s books, Facebook, Twitter, educational videos, print, radio and even television. I’ve done a lot in my 14 people years. (That’s 91 in dog years if you’re counting.) So I wasn’t really that surprised when I was asked here for an interview. But you have to understand, I’m a dog. All I think about is food. And naps. And sniffing. And food. Did I mention food? Well, they’re using that love for food against me. I’m told there are some major treats waiting for me when I’m done with this feature piece. I can work with that! Indies Unlimited (IU): Mr. Pish, tell me about traveling across country with your people. Were they hard to look after? What was your biggest challenge? Wow. Start with a hard question why don’t you? My people were very high maintenance. “Where should we stop?” “We have to be here at this time or that time.” “What’s for lunch?” It’s so easy for me. Put a bowl of food in front of me and I’m happy. My biggest challenge was that everyone wanted to pat me. I was supposed to look at the camera and smile while they were doing that. I’m a simple dog, I just want to have fun. It’s a big responsibility being in the right place at the right time so we can trick…um I mean teach children about important places and things. Do I get my treat now? IU: How did you find the food in the cities and localities you visited? Did you find a new favorite cuisine? Is that a trick question? Of course, I found food with my nose! My food traveled with us all the time. But I still made sure to beg with my cute face and big brown eyes and my people are so sappy they always fall for giving me a tiny piece of something. I did discover two new foods on this trip, though. I got to go to Gino’s East in Chicago and sniff out the deep dish pizza there. That was fun. I got treated like a real celebrity! Then in Philadelphia, I tried a Philly Cheese Steak at Pat’s King of Steaks. Did I mention I love food? IU: After the first two books, were you at all concerned on this last trip about being recognized and hounded by paparazzi and autograph seekers? Funny you should ask that! I did meet people who knew who I was in a few places! In Sauk Centre, Minnesota – the nice lady at the hotel had a daughter in grade school who had used my book in class for an assignment! And an Olympic Gold Medalist horse trainer at Tempel Farms near Chicago recognized me too! I was in a few parades this year in my home state of Washington, and it was very fun to hear people yelling “Hi Mr. Pish!” and taking my picture. IU: Obviously, you were chauffeured by your people (as a celebrity should be). Tell me who you think was the better driver. Hmmm. Another tough question. Is this like a game show where I can say “pass” or something? What? No treat if I don’t answer all the questions? Isn’t that extortion? My secretary is a very excellent driver. My official chauffeur – Driver Dave – he isn’t bad either. I have no complaints either way. You have to remember – these two people feed me. I may be simple, but I’m not dumb. IU: Did you visit anyplace where you were not welcomed with open arms? Yes. I was a little sad that I got kicked out of 30 Rock in New York City. But that’s okay, because I got to have my photo taken with two of New York’s finest, and that was an honor! IU: What was the most frightening experience of the whole trip? North Dakota: we were driving through a blizzard on the highway there and we couldn’t see 10 feet in front of the car. We didn’t want to risk pulling over, and we couldn’t stop in the middle of the road. I didn’t like that very much. IU: Did you meet any other celebrity dogs in your travels? There are other celebrity dogs? IU: After the trip, did you assist Ms. Brooks with any aspects of the writing, editing, or marketing of the book? Is that what I’ve been doing? I just thought I was running my empire. Heh heh. My name is on the books, so I have to make sure they are properly represented! I had to pose for a few additional photos, I was in some parades as I mentioned earlier, I was on two television news programs…I’ve lost count. I’ll do whatever I can as long as those treats keep coming my way. IU: What is the most important message you want children to get from the story of your travels? I want kids to see what’s right outside their doors. This country, and Canada, is just filled with cool places and things to do and see – they don’t even have to leave their yards to find these things – if they just take a moment to look. That’s why I have Mr. Pish Approved Places on my web site – I’ve gone all around the USA and Canada in search of fun, affordable places for kids and their families to get outside…and learn. IU: Are you pleased with the response to your books? I currently have 33 5-star reviews on Amazon.com, so that’s pretty awesome. But what makes me the happiest is receiving letters from kids telling me how much they like my books. So yes, I’m very happy! IU: I’ve heard that your books are used in schools around the world. Around the WORLD, really? Yes, really! 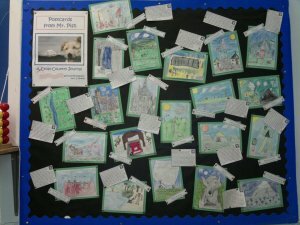 There’s a school in Scotland where they made an entire wall of postcards based on my first book! And it’s being used all over the USA, and even in Mexico. 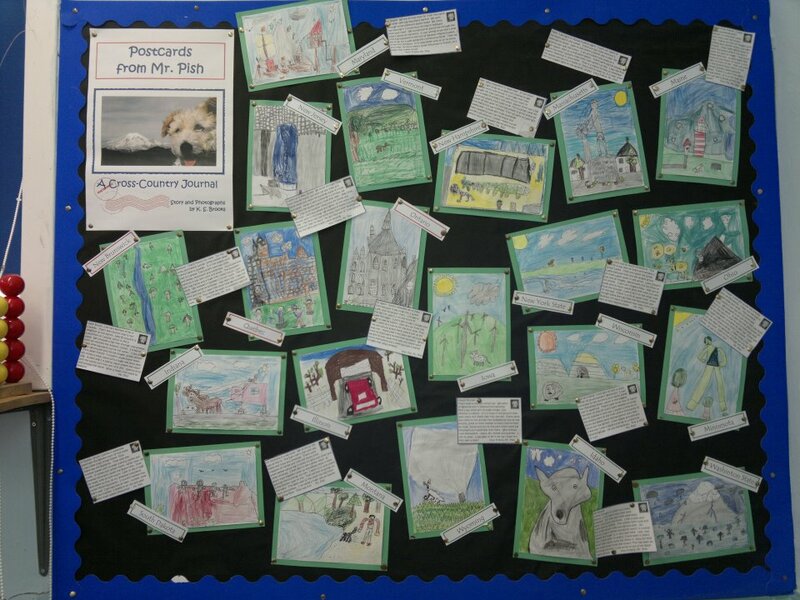 I’m really glad my books are inspiring kids to write their own postcards, and to become great explorers. IU: What’s next for you Mr. Pish? We have two more books to work on from the huge cross country tour I did in January 2011. And I know we have at least one other book nearly done for release in 2012. After that, I don’t know, but I’m sure my secretary will come up with something! NOW do I get my treats? Woof! Mr. Pish is the main character in three educational children’s books: Postcards from Mr. Pish Volumes 1 and 2, and Mr. Pish’s Woodland Adventure. Those are available in print on Amazon.com and on Nook at BN.com. The “Mr. Pish Approved Places” are listed on a big map of the USA and Canada at on Mr. Pish’s website. All Mr. Pish’s books promote outdoor learning and literacy and benefit the Arbor Day Foundation. You can also join Mr. Pish on Facebook. Mr. Pish, I had no idea you were so familiar with Canada. Do you find the paparazzi don't bother you so much here? We do try to play it cool. 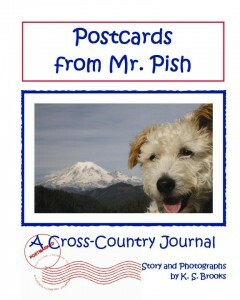 I love hearing about your adventures, Mr. Pish. I'm looking forward to your new books. Mr. Pish says "thank you, I'm looking forward to sharing my adventures with everyone!" Love it!!! Have a safe and happy new year, Mr. Pish. Enjoy your travels. Greta, Mr. Pish sends his regards and says Happy New Year to you as well!